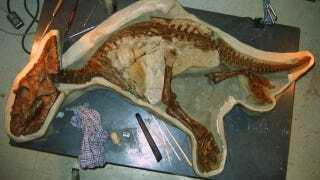 Paleontologists working in Alberta have unearthed a nearly complete fossilized skeleton of a tiny rhinoceros-like dinosaur. The little guy was only about 3-years-old when it died — and its pristine condition is providing scientists with important clues as to how it met such an untimely death. The toddler belonged to a species known as Chasmosaurus belli, which was closely related to the Triceratops. The horned, frill-headed dinosaur lived in southeastern Alberta about 70 million years ago. The paleontologist who found it, the University of Alberta's Philip Currie, spotted the dinosaur's frill jutting out from a hillside in Alberta's Dinosaur Provincial Park. The only part of the dinosaur that was missing was its forearms, which fell down a small sinkhole that opened up underneath the remains. Fascinatingly, the young dinosaur's body closely resembles that of its mature form, an indication that its bodily proportions stayed fairly consistent throughout their lives. Adults grew to a size of 16 feet (5 meters) in length and weigh around two tons. This sample measures 5 feet (1.5 meters) long. So how did it die? The paleontologists could not find any bite wounds or other injuries, not even from scavengers. And it was found in layer of sediment — the kind that's found at the bottom of a river. The most likeliest explanation, therefore, is that it was wading in a river when it was overcome by the current, drowned, and was then covered by sediments at the river's bottom.